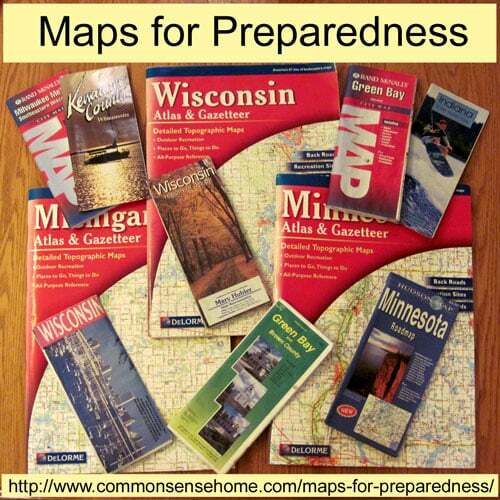 Hard copy maps for preparedness are an item that many people may not even consider that could save your life. If you need to evacuate, you can plot alternate routes to avoid congestion and problem areas. If you need to hunker down in place, you can mark local resources and friends and neighbors, as well as high risk areas. This post outlines map suggestions that can help keep your family safe and stocked in case of emergency, and provided for as you build your food and preparedness stores. We recommend hard copy maps because the power is often out during emergencies and certain emergencies such as solar flares or EMP pulses will disrupt electronic equipment. Piece together nine of the USGS 15-minute maps, with your camp, house or property on the center map. Mount that map on an oversize map board. Draw in the property lines and owner names of all of your surrounding neighbor’s parcels in at least a five mile radius. Get boundary line and current owner name info from your County Recorder’s office. Study and memorize both the terrain and the neighbors’ names. Cover the whole map sheet with a sheet of heavy-duty acetate, so you can mark it up just like a military map. It will help you get to know your neighbors. When you are introduced to one of them, you will be able to say, “Oh, don’t you live about two miles up the road between the Jones place and the Smith’s ranch?” Make up an emergency contact list with phone numbers/e-mails that corresponds to all of the names marked on the map, plus city and county office contact numbers for quick reference. Tack the list upright next to the map board, and keep an extra copy in your emergency information binder. As you get to know people, you can make notes on the phone list or the map about resources they may have for barter or sale. Since we've moved here, I've found neighbors who are willing to share, trade or sell: eggs, milk, beef, walnuts, rhubarb, asparagus, homemade soap and more. See The Art of Barter: How to Trade for Almost Anything for more information on bartering. Mapping every single neighbor in a give mile radius is not going to work very well in a more crowded environment, but it is good to at least know those who live closest to you and to have their contact information. Remember the concept of “safety in numbers”. If things get crazy, it's a heck of lot better to be surrounded by people who have your back and who may be likely to work with you to cope with whatever unfolds. Know your exit routes, map them. Have multiple exit routes, don’t plan on just one. If there is an emergency, primary routes are likely to be blocked by traffic. Depending on the type of emergency, traffic may also be rerouted around certain areas (in the case of accidents such as crashes or chemical spills, for instance.) Map to alternate stash points such as a storage unit. Map to multiple exit points. Map to your family/team. See Bug Out Bag or Get Home Bag for some ideas on what to pack when you need to scoot in a hurry. A reader noted that during a period of excess rain, they put red dots on their map to mark high water points where the roads were blocked. Very good idea. As always, evaluate your risks, and plan your preparedness mapping accordingly. I chose the symbol of an ant for the link up because of the old fable of “The Ant and the Grasshopper“. 1. This is a preparedness link up for those who want to be more self-sufficient. We welcome posts on growing/raising/hunting food and food storage, self-reliance skills, home remedies, herbalism, wildcrafting, building and repairing, emergency medicine and all things prepping. Just use the link up tool below to enter your post. Please link directly to the relevant post, not your blog’s main page. 2. Please link back to this post from your featured content. You may use the image below as part of your link if you would like to do so. Sites that don’t link back will not be featured on the CSH facebook page or Pinterest boards. 3. Keep it clean, skip the ads. This is a PG-13 site, and I want to feature prepping posts, not ads and giveaways. 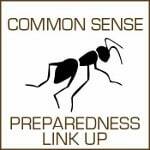 Each week I’ll be adding my favorite posts to the Common Sense Preparedness board on Pinterest. 4. Leave a comment if you’d like to share a little more information about your post and/or any preparing you’re currently working on. If you are reading this post via email, click through to join in or visit this week’s links. Don’t forget to check out the Preparedness page for a list of articles already on the website. This is actually on our Preplist this weekend – get a local map and a state map for each of our go bags and for the cars. We’ve done a printed city map that we’ve covered in contact paper to keep it more waterproof and rolled to be able to have ways of getting through the countryside immediately. Good for you! We’ve got an assortment of maps, but are still building the collection. Another interesting thing that I didn’t mention in the post is zoning for different areas. Our township has a long term development plan and is zoned accordingly, so this helps keep track of what’s likely to be built in an area. Just want you to know I love your site! It is one stop shopping for all things homestead! My husband and I are headed in that direction, our goal is to move onto a piece of property somewhere 2 years from now. We hope to buy it this summer so we have 2 years to develop and build. I am sure I will be making many more visits to your site in the months and years to come! Hi Julie! I like your blog name. 🙂 Much success to you and your family with your homesteading adventures, and thank you for your kind words.